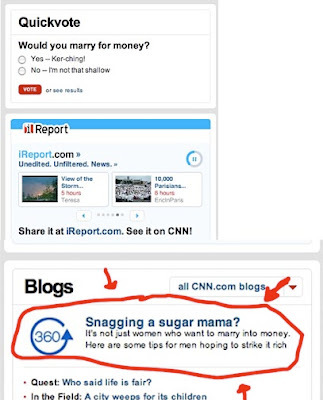 Looks like the guy or girl who does “Quickvote” on CNN.Com is having some guilt issues regarding whether or not he or she’s a whore. Hey, Quickvote person- don’t involve us in your personal life! Just because you’re clearly about to marry someone for money doesn’t mean you need to burden all of us with your need for acceptance! Oh, and, gee- I wonder if the person who does the “Quickvote”, is the same person who also blogs for 360? 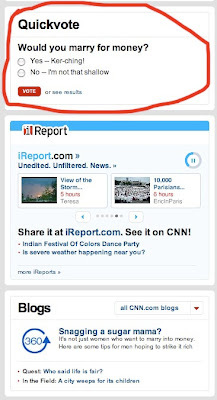 Hey person who does “Quickvote” on CNN.Com- pull yourself together!